PINE BLUFF, Ark. – One way to help struggling pastures recover and increase the amount of available forage is with warm season annuals, said David Fernandez, Cooperative Extension Program livestock specialist at the University of Arkansas at Pine Bluff. Warm season annuals are grasses that grow best when temperatures rise beginning in late spring. Examples include crabgrass, sudangrasses, sorghum-sudangrass hybrids and pearl millet. Crabgrass is often an overlooked and maligned warm season annual. Fernandez reminds ranchers cutting hay that crabgrass requires more time to dry than bermudagrass. However, crabgrass is typically of much better quality than most summertime grasses, including bermudagrass. Plant crabgrass once soil temperatures reach 50 F until about mid-June. Crabgrass seed is small and should not be planted deeper than .25 inch. Broadcast 2 to 5 pounds per acre on a fine, well-prepared seedbed followed by a pass with a roller to cover it. Crabgrass is an excellent reseeder so it can continue in pastures year after year if allowed to produce seed before frost, he said. Begin grazing crabgrass when it is 4 to 6 inches high. For rotational grazing, begin grazing when the grass is 12 inches. Leave between 3 to 6 inches of stubble for good regrowth, Fernandez said. Sudangrass is a rapidly growing annual that looks like Johnson grass, but it is easy to control. It can be drilled or broadcast at a rate of 20 to 30 pounds per acre. Sorghum-sudangrass hybrids should be drilled at a rate of 20 to 30 pounds per acre and broadcast at 30 to 45 pounds per acre. Pearl millet can be drilled at 15 pounds per acre or broadcast at 25 pounds acre. For best production, fertilize according to your soil test. In southern Arkansas, planting may begin by May 1, but in the northern parts of the state, wait until mid-May. Plant as late as the end of June in southern Arkansas and up to mid-July in northern Arkansas before soil temperatures become too warm for good stand development (86 F), Fernandez said. Soil temperatures should be at least 68 Fahrenheit before planting. 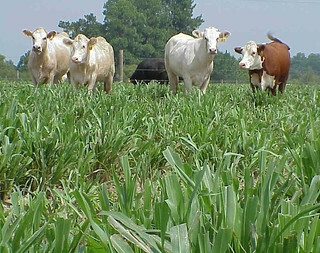 Grazing sudangrass or sorghum-sudangrass hybrids can begin when they are 24 inches tall. Rotate livestock to another pasture when sudangrass is down to 10 to 12 inches and sorghum-sudangrass is down to 4 to 6 inches for good regrowth. Fernandez warned that producer should “never graze horses on or feed them hay from sudangrass or sorghum-sudangrass pastures,” because horses may develop cystitis syndrome disease. Do not harvest or graze drought-damaged sudangrass for at least 4 to 7 days after a good rain to avoid nitrate poisoning or after a killing frost to avoid prussic acid poisoning in other livestock. Prussic acid poisoning is not a problem in pearl millet which is leafier than sudangrass. Pearl millet does not tolerate cold as well as sudangrass and sorghum-sudangrass hybrids, but it tolerates acidic soils and diseases better. Begin grazing pearl millet when it is 12 to 18 inches tall, but be sure to leave at least 4 to 6 inches of stubble for good regrowth. It can be harvested for hay once it is 2 to 4 feet tall. For more information about summer annuals and pasture management options, contact Fernandez at (870) 575-7214 or fernandezd@uapb.edu.